A terracotta head of a youthful man with Western features. The hair is stylised and is parted in the centre, the thick strands flow backwards, away from the face. The face features almond-shaped eyes that are framed by arched brows, a slender nose and full lips. The ears are carefully modelled. 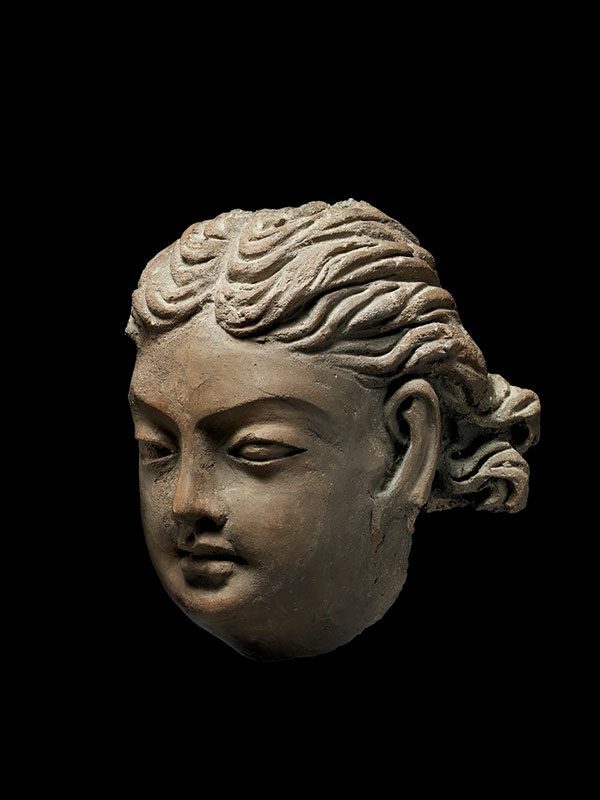 The ancient region of Gandhara was for centuries an incredibly wealthy area owing to its position on the Silk Road trade routes linking China, South India, and the Mediterranean. The art from this region is a compelling fusion of foreign styles that give visual form to Buddhist religious ideals. More Buddhist sculpture and architecture has been found in Greater Gandhara than in any other region in South Asia. Alexander the Great, the Macedonian king, conquered the regions of Gandhara, Bactria and Swat in 327 BC. These areas came under the control of his generals after his death in 323 BC and were considered part of the Hellenistic world. The art made at this time is overwhelmingly Hellenistic in character, and it is likely that Greco-Roman artisans worked alongside local craftsmen, catering for a local audience. The present portrait is stylistically Roman in spirit, and was possibly made by one of the craftsmen who came from the West. This head appears to portray a western man and represents possibly a portrait of one of the Hellenistic officials. Some resemblance can be seen in a portrait of Alexander the Great now in the Archeological Museum in Istanbul. The naturalistic treatment of the facial expression and hair suggest a youthful person, details that are not seen in depictions of the Buddha or bodhisattva.